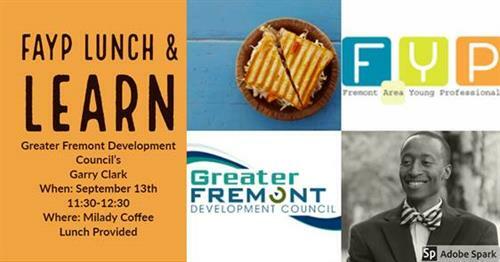 Join Fremont Area Young Professionals on Thursday, September 13th at Milady Coffeehouse from 11:30 A.M. to 12:30 P.M. to hear from Garry Clark of Greater Fremont Development Council. With the continual growth of our commmunity, Garry recently conducted a study over the quality of life opportunities in Fremont, including housing. Come hear about his findings. Please RSVP by Wednesday, September 12th at 12:00 P.M. on FaYP's Facebook Page.